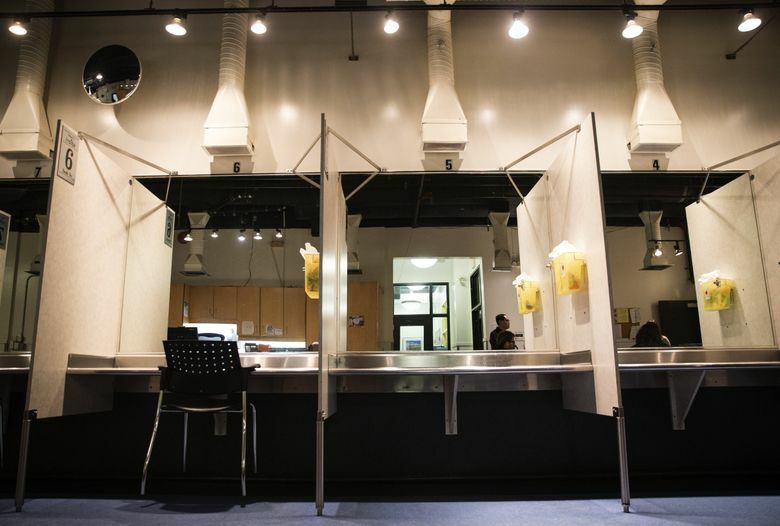 The U.S. Department of Justice’s threat of “aggressive action” against cities opening so-called safe injection sites dimmed the prospects of opening one in Seattle. With only a few words, the Trump administration this week darkened Seattle’s prospects of opening up the first supervised drug-injection site in the United States, leaving local authorities and advocates struggling to plot a new way forward. In a New York Times Op-Ed, Rod Rosenstein, the deputy U.S. attorney general, said Seattle and other cities will face “swift and aggressive action” by the federal government, including a civil injunction, if they sanction so-called safe injection sites for “illicit” use of heroin and other drugs. The statement is the clearest indication yet of the Trump administration’s opposition to the sites, and its willingness to enforce federal drug laws against municipalities and states — from San Francisco and New York City to Colorado and Maine — that have shown interest in opening them. Seattle and King County have tiptoed in pursuit of opening one since 2017, when county Executive Dow Constantine and former Seattle Mayor Ed Murray adopted the recommendations of a task force focused on the rising number of opiate overdoses. The task force’s 2016 report called for a pilot program to open two public sites — one in Seattle and one elsewhere in King County — where drug users would receive clean needles and inject in a clean, supervised environment. A site has been in operation in Vancouver, B.C., since 2003. While its record is mixed, local supporters believe the sites could reduce opioid-related overdose deaths, which in King County rose from 219 in 2015 to 258 last year, and better connect drug users with health care and long-term treatment. But Rosenstein’s message has removed any uncertainty about the legality of the sites, Annette Hayes, the U.S. Attorney in Seattle, said on Thursday. “The ground has shifted under us,” she said. Emergence of the powerful opiate fentanyl, which began a new wave of abuse and overdose deaths, has led the federal government to believe there are “better ways” to address the problem, she said. Hayes said her office will use “all the tools that are appropriate” if a local municipality moves to bring a site into operation. Rosenstein’s statement rekindled tensions between federal and local authorities, who continue to spar over Seattle policies that are at odds with Trump administration priorities. “Last I checked, Rod Rosenstein is a very capable deputy attorney general, not a surgeon general,” said Seattle City Attorney Pete Holmes, who supports opening a safe injection site. “If we hope to simultaneously unwind the ‘war on drugs’ and address this crisis with real solutions, we apparently can’t look to Jeff Sessions and the Trump administration for help,” he said. Holmes said his office is evaluating its options in light of Rosenstein’s threat. Seattle Mayor Jenny Durkan, who has also expressed support for a safe injection site, did not immediately respond to request for comment. Despite the support from Seattle leaders, efforts to open safe injection sites stalled out of the gates, and now appear to be at a standstill. After Constantine and Murray embraced the recommendations, Bellevue, King County’s second-largest city, banned safe injection sites. It was joined by Kent, Renton, Auburn and Federal Way. An initiative campaign to ban them countywide, called Safe King County, collected the required 47,443 valid signatures to get on the February 2018 ballot, but the initiative was blocked by a court ruling. A spokesman for Public Health – Seattle & King County said there are currently no plans to open a safe injection site outside of Seattle. The Seattle City Council allocated $1.3 million in its 2018 budget to get the pilot program off the ground, but city officials say they’ve been unable to locate an appropriate site for a fixed “community health-engagement” location. Since taking office last year, Durkan floated a proposal to forgo a fixed location and purchase a recreational vehicle that could travel from one location to another. Seattle City Councilmember Sally Bagshaw said talks about the mobile option are ongoing. In the meantime, the city should take Rosenstein’s threat seriously and put its weight into seeking ways to increase the availability of drug-abuse-treatment options, she said. “I think a safe injection site is an option, but at this point the more pragmatic alternative is to invest in treatment on demand,” Bagshaw said.